The Sd.Kfz.253 was designed along with the Sd.Kfz.250 light infantry transporter and the Sd.Kfz.252 ammo transporter. However, opposed to the multifunctional Sd.Kfz.250 (and the bigger Sd.Kfz.251), the 253 as well as the 252 were specialized vehicles. Whilst the Sd.Kfz.252 was supplying ammunition to tanks and artillery guns, the 253 was developed mainly for observing and directing friendly cannon fire against enemy targets. The Sd.Kfz.253 fitted very well into the German combined arms tactics and was used for cooperation with assault self-propelled guns like the Sturmgeschütz III. From 1937, when the new ‘Sturmgeschütz’ vehicles and their associated tactics were being designed, the army ordered new vehicles to support the assault guns. The new support vehicles needed good protection and the capability to operate in areas with poor or no roads, so they had to be armored and tracked. Initially, the German designers planned to build this type of vehicle using the Panzer I as a base. The new Sd.Kfz.253 observation vehicle was similar to the Sd.Kfz.250. It was designed as an armored half-track and received the designation number 253 in the army vehicle nomenclature. 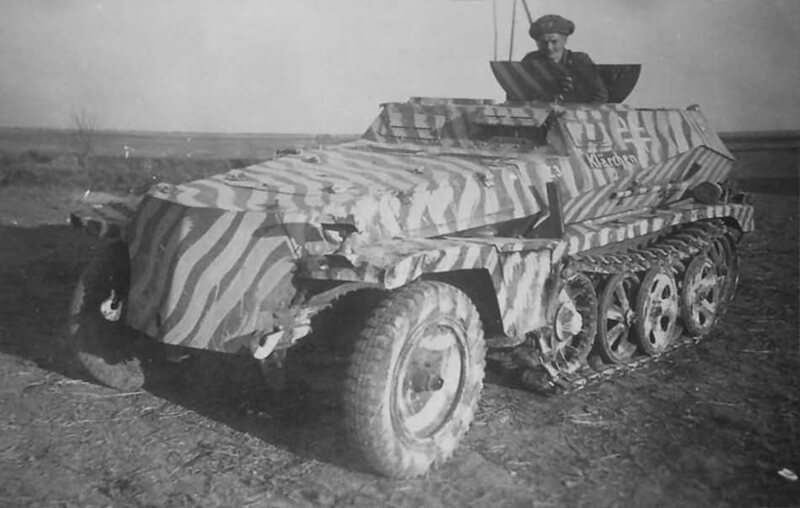 Later, the vehicle was just referred to as the “Beobachtungswagen” meaning “Observation Vehicle”, or, later, “leichter Gepanzerte Beobachtungswagen” meaning “Lighter Armored Observation Vehicle”. The prototype was ready in the autumn of 1937. The start of production was planned for 1939, with the first 20 half-tracks built by the end of the year and another eight in January 1940. However, the army was pleased with the new Sd.Kfz.251 half-track and the production of the Sd.Kfz.253 was postponed with just the first 25 units produced in March 1940. After the confirmation that these new half-tracks were successful, the production started in earnest. The last half-tracks of this type were produced in June 1941 with 285 built in total. The chassis were manufactured by the Demag company of Berlin and Oberschoneweide, with the rest of the vehicle being done by the Wegmann company. After September 1940, the whole production was moved to the Austrian company Gebr. Bohler & Co AG of Kapfenberg. These vehicles were later replaced by special versions of the Sd.Kfz.250 and 251, as the sub-versions met all requirements and were cheaper and easier to manufacture. Sd.Kfz.253 was very similar to Sd.Kfz.250 and only the top part of their construction differed. The Sd.Kfz.253 had an enclosed crew compartment. The roof had two hatches; the main hatch was prominent, circular and was placed behind the driver’s station. The hatch could be rotated and it opened in two parts. This hatch also had two small openings which could be used for a periscope and were covered by two flaps when not in use. The second hatch (rectangular) was placed behind the main one and was much simpler. At the rear of the vehicle, on the right side was a simple aerial. A cover ran lengthwise across the right-side of the vehicle roof, which protected the aerial when the vehicle was on the move. 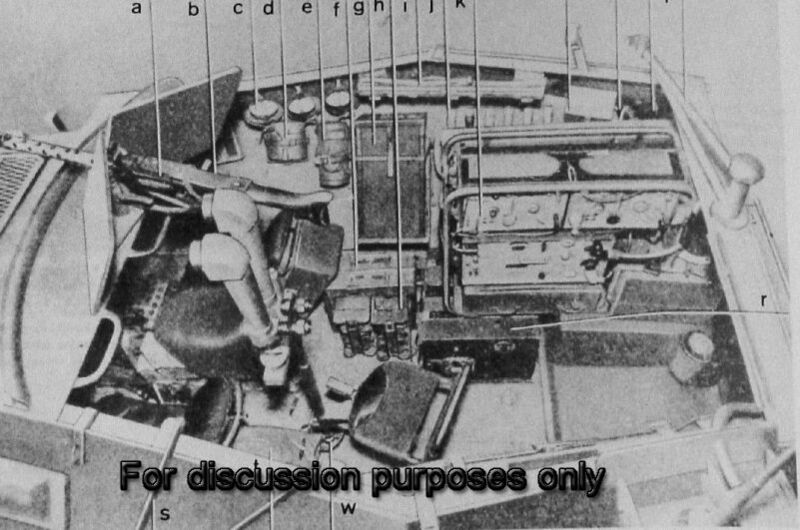 Two radios were available inside the Sd.Kfz.253, an Fu 6 and an Fu 2. A retractable periscope and signal flags were also carried inside. This vehicle had no weapon ports or mounts, but a single machine gun (MG 34 or MG 42) was carried inside for self-defense. The crew was also armed with their own weapons, like grenades or handguns. The armor of the Sd.Kfz.253 ranged between 5.5 and 14.5 mm. However, reports from tests on captured vehicles claim the maximum value was 18 mm. At least one Sd.Kfz.253 in the North African theater was fitted with a large frame antenna over the roof. 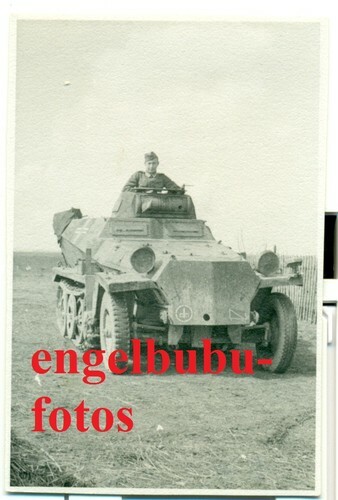 There is also a photo of a vehicle mounting a Panzer I turret on top. However, the angle of the photo makes it impossible to tell if it was a Sd.Kfz.250 or a 253. According to video sources, the first wartime use of this half-track in the war was in September 1939 – a vehicle, possibly a prototype, was recorded together with tractors and cannons during the crossing of the Bzura river, in the Sochaczew city. 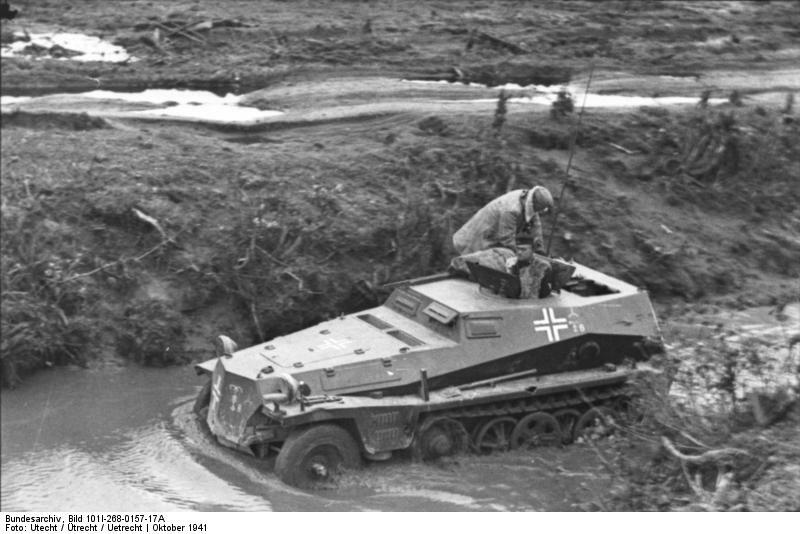 During wartime, it was typical for the Wehrmacht to test prototypes on the frontlines (like the Dicker Max self-propelled gun), so the first Sd.Kfz.253 was probably also tested in action. The Sd.Kfz.253 were used in Battle of France, however, their contribution was very small. The Sd.Kfz.253 was used together with StuG units. In France, these vehicles were only tested, and their career started seriously along with the StuG III. They were in use during the invasion of Yugoslavia and Greece (May 1941) and later in Croatia. During the Balkan Campaign, assault guns (and their support vehicles) proved their effectiveness. Later, these support vehicles were used during Operation Barbarossa (the invasion of the Soviet Union) and in North Africa. The Sd.Kfz.253 (just like the 252) was used on the frontlines until summer 1943, when the sub-versions of Sd.Kfz.250 and 251 replaced them. Their final great engagement was during the battle of Kursk. However, individual Sd.Kfz.253s still saw sporadic action after this point. It is interesting to note that, on the Eastern Front, these vehicles were sometimes used as ambulances. 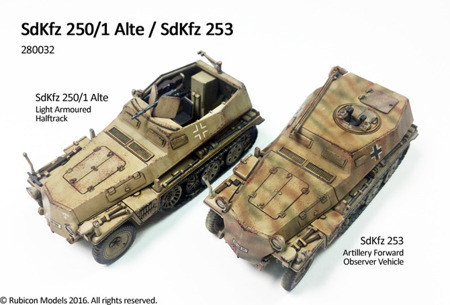 Sd.Kfz.250/5.II: Fu 12, later Fu 12 + Fu.Spr.Ger.f – destined for reconnaissance units. Kolekcja Wozów Bojowych magazine, nr. 62: Sd.Kfz. 252 Leichte Gepanzerte Munitionskraftwagen, Oxford Educational sp.z o.o.